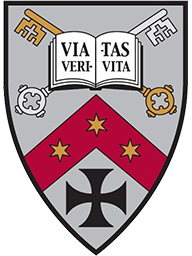 He served as president of the Benedictine College Alumni Association from 1991 to 1995 and joined the Benedictine College Board of Directors in 1992, serving until October 2004 when he became president of the college. Steve’s wife, Amy (Kohake), graduated from Benedictine College in 1984 and currently teaches in the Education Department at Benedictine College. The couple has three children, Matthew, Michael, and Molly. Kimberly Shankman received her PhD in Political Science from Northern Illinois University. Subsequently she taught in the Politics and Government Department at Ripon College from 1985-2001, when she left to take her current position at Benedictine College. Her research interests are American political thought and constitutional law. She is the author of Compromise and the Constitution: The Political Thought of Henry Clay. Additionally, she has published articles relating to the privileges or immunities clause of the 14th amendment and other aspects of constitutional law. She spoke recently on “Truth and Democracy” at the University of the Sacred Heart in Milan, Italy, and on “Human Capital in Caritas in Veritate” at Columbia University in New York. Previously, Dr. Wurtz served as the Dean of Students at Christendom College in Front Royal, Va., the Director of Student Activities at Benedictine College, and as a Resident Director at Benedictine College. Joe received his BA in philosophy from Benedictine College, his Master’s degree in Higher Education Administration from the University of Kansas and his doctorate in Higher Education Administration at The George Washington University in Washington, D.C.
Wurtz served as a FOCUS missionary at Benedictine College from 1999-2000 and at the University of Denver from 2000-2001. He currently serves on the Board of Directors for FOCUS. He and his wife Megan live in Atchison, Kansas, with their four children. As Writer in Residence, Tom Hoopes publishes weekly with three Catholic publications (National Catholic Register, Aleteia, and Catholic Vote) and occasionally with Catholic Digest, Columbia, and others. He served as executive editor of the National Catholic Register for 10 years and editor of Faith and Family magazine for five. Hoopes previously served as press secretary for the Chairman of the U.S. House Ways and Means Committee. He earned a certificate from the St. Ignatius Institute at the University of San Francisco along with his Bachelor’s degree and earned his Master’s in Business Administration from Benedictine College in 2010. He and his wife, April, have nine children and live in Atchison, Kansas. Jamie Blosser teaches courses in church history, ecclesiology and New Testament. He received his Ph.D. in Historical Theology from The Catholic University of America in Washington, DC, and wrote his dissertation on the theological anthropology of Origen of Alexandria. Before teaching at Benedictine College he worked at the U.S. Conference of Catholic Bishops in Washington, DC. His main interest is in the study of patristics or early church studies, in particular Origen and Augustine of Hippo. He and his wife Danielle have five boys: Augustine, Ambrose, Cyprian, Basil and Cyril. Dr. James Madden lives in Atchison with his wife (Jennifer) and their six children; William, Martha, J. Patrick, Brendan, John and Cormac. He is originally from Wisconsin, and did his graduate work at Kent State (MA, 1998) and Purdue (Ph.D., 2002). He was awarded the Benedictine College Distinguished Educator of the Year Award in 2006. Dr. Madden’s research interests are in the philosophy of mind, the philosophy of religion, metaphysics, and epistemology. Recent Scholarly Work: Mind, Matter, and Nature: A Thomistic Proposal for the Philosophy of Mind, CUA Press (book under review); “Realism, Nominalism, and Biological Naturalism,” International Philosophical Quarterly, March 2011; “St. Thomas on the Demonstration of God’s Existence,” Aquinas Review (under review), co-authored with Jean Rioux; “The Fifth Way, Scientism, and Intelligent Design,” Faith and Reason. (Summer 2007); “Qualia and Constitution in Body-Self Dualism,” Symposium on Body-Self Dualism in Contemporary Ethics and Politics by Robert George and Patrick Lee, Annual Meeting of the American Maritain Association, October 16th, 2010; “Atheism, Theism, and the Possibility of Biological Naturalism,” The Perennial Philosophy Lecture at Loras College, May 7, 2009. Dr. Nicholas began teaching at Benedictine College in 1992. He was NEH Fellow and visiting faculty member at Harvard University, 1993. He has been chairman of English department, Benedictine College, 1995-present. His principal areas of study are medieval and Renaissance literature, most particularly Old English poetry, Old Norse sagas, and the works of Shakespeare. He is an enthusiastic electirc guitarist; nevertheless, his hearing is still pretty good. Susan (Orr) Traffas came to Benedictine College in the Summer of 2008 after spending the last 21 years working in social policy in Washington, DC at various think tanks with several stints in federal government. She worked most recently with the Bush administration. From 2001-07, she was the Associate Commissioner of the Children’s Bureau, the oldest federal agency dedicated to child welfare. From 07-08, she served as the Deputy Assistant Secretary for Population Affairs at the US Department of Health and Human Services, where she worked on pro-life issues. As the director for postgraduate support, Dr. Traffas works with students who are pursuing graduate and professional degrees; she also finds fellowship and scholarship opportunities for qualified students to further their academic careers after graduation. Dr. Traffas received her B.A. in Politics from the University of Dallas and her M.A. and Ph.D. from Claremont in Government. She published Jerusalem and Athens: Reason and Revelation in the Works of Leo Strauss in 1995.